Auto Claims Recoveries – DIMONT | Modern Technology. Nostalgic Service. DIMONT’s insurance claims and related solutions deliver significant recoveries to auto lenders while dramatically reducing their default-related losses. Our data-driven Insurance Monitoring service provides a cost-effective, streamlined insurance tracking and an automated monitoring process for auto lenders. We use technology to consolidate insurance information on the collateral within the lender’s portfolio, confirming collateral protection in the event of a repossession claim. We can also provide custom data feeds of insurance-related information to lenders. For consumer lenders, effective loss management is a critical success factor for their long-term business survival. 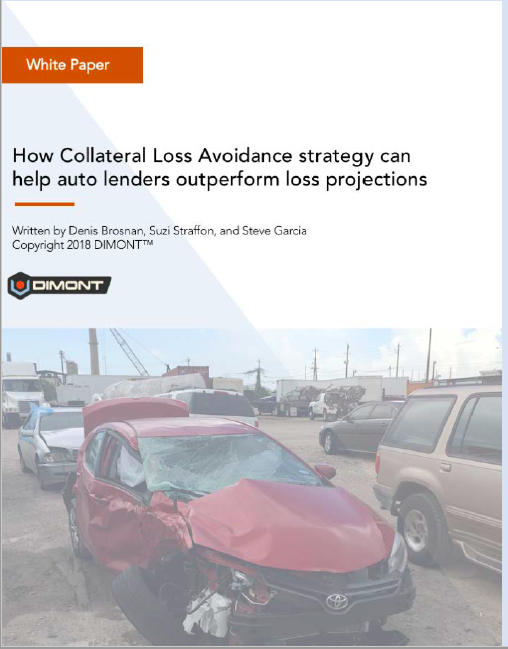 As a result, lenders spend a significant amount of time and effort forecasting their loss projections on auto loan originations and other asset classes. One in eight licensed drivers is uninsured. And the number among uninsured drivers and subprime auto borrowers is even larger. Our numbers show that 35-40% of subprime auto loan borrowers are uninsured, while the uninsured rate is 10-15% for prime portfolios. However, the story is more complex than the numbers reveal. Lenders must consider the loan-to-value amounts of their portfolio, the margins earned on loans, and how their profits can be compromised by claims as a result of this issue. This webinar examines the credit risks posed by uninsured drivers and provides strategies for mitigating the risks faced by auto lenders.